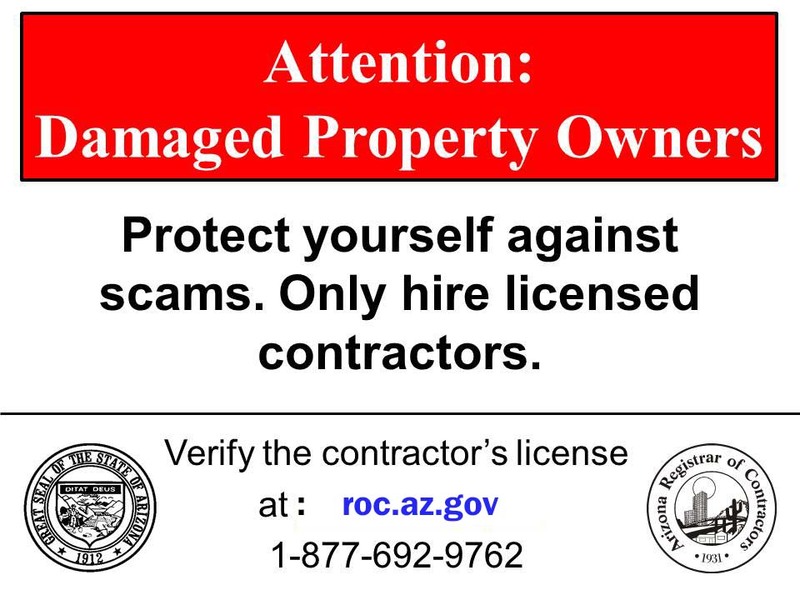 Representatives with the Arizona Registrar of Contractors were doing rounds of the neighborhoods as well to warn residents about “storm chasers” or “fly-by-night” contractors who are unlicensed, often come in from out-of-state and try to take advantage of homeowners who they know are about to get insurance money to rebuild, agency spokesman Jim Knupp said. Clear Creek Drive skirts the edge of East Clear Creek Canyon in the Blue Ridge area. The flames of the 16,000-acre Tinder Fire made their mark here, replacing large stretches of ponderosa pine forest with an expanse of blackened trunks and charred ground. Driving along the street, there is no clear pattern in how the fire took its toll on homes. One house along the road still stands while the residence next door burned to the ground. On another lot the house was decimated but the adjacent garage was relatively unscathed. In some places the fire crossed the road, in others it didn’t. In all, the fire destroyed 33 homes and 54 other structures that were on or near the edge of the canyon. Five of the homes lost were primary residences, according to an initial analysis by Coconino County. The fire was the most destructive as far as home loss and property damage that the county has seen in at least the past 20 years. The man, who declined to give his name, said he was “trying to take it all in” as he ran a metal detector over the place where his garage used to be on Tuesday afternoon. Despite the damage, fire officials say some notable success stories came out of the fire: residents’ efforts to clear fuels away from their homes, thin trees on their properties and design landscaping with fire in mind worked to save them from the flames. “We really could have had more homes lost,” said Mark Brehl, with the Arizona Department of Forestry and Fire Management. Winds that day were gusting at least 45 mph and, because they aligned with the topography of East Clear Creek Canyon, they funneled the fire directly toward homes in the Blue Ridge area. Some homes were clearly torched by the superhot head of the fire as it surged up from the canyon below, and in that case there wouldn’t have been much the homeowner or firefighters could have done, Brehl said. In many other cases however, homes were lost and others were saved not because of the fire behavior but because of what burnable fuels were on the property or next to the house, he said. Andrew Owen, a program manager with the Arizona Department of Forestry and Fire Management, was on a crew assigned to protect neighborhoods when the flames of the Tinder Fire swept through. Pine needles that had been left to pile up near homes, woodchips used to make pathways and doormats and furniture cushions on porches all acted as ready fuel for embers that got blown out ahead of the fire or the flames that followed, Owen said. When firefighters are pressed for time, they often have to triage homes to focus resources on homes they are most likely to save without risking firefighter safety, Owen said. The amount of work a homeowner has done to make their property less susceptible to fire increases the likelihood that firefighters will be able to dedicate resources to save it, he said. Homeowners that had laid down a buffer zone of gravel, for example, or had cleaned up debris like pine needles and thinned trees and low branches, gave the fire little to burn so crews were able to easily defend the property, Owen and Brehl said. “There are a lot of little things that can mean so much in protecting your home,” Brehl said. In another case, something as small as a dirt dog path through the grass stopped the flames from threatening a house, said Jeff Thumm, fire management specialist on the Mogollon Rim Ranger District, who was also on the fire. In several other instances, firefighters had to cut away front porches and tear fences away from homes to save them, Thumm said. A total of 1,000 homes in the Blue Ridge area were evacuated for almost a week due to the fire. Residents who were allowed to return home on Friday found spoiled food in refrigerators and freezers that had been without power for several days, smoke damage and, for some, a pile of melted metal and concrete where their house once was. The county and the state set up a temporary individual assistance service center to help those affected by the Tinder Fire. Residents were served meals and were able to get food and other basic necessities, building and development assistance, tree hazard assessments, water well testing and other services. As of Tuesday afternoon, the center had logged 88 visits from residents and served up hundreds of meals, said Dan Porth with the Department of Emergency and Military Affairs. The county’s public health district also had given 50 tetanus shots and given out more than 25 well water test kits by Tuesday, said Julie Augeri, the county's public health emergency preparedness program manager. With power turned off for several days, there was a concern that bacteria like E. coli would start to grow in stagnant well water, Augeri said. The fire hasn’t caused Michael Payne to reevaluate his decision to live in the Blue Ridge area, surrounded by ponderosa pine forest. His HOA requires homeowners to abide by Firewise principles and he personally has cut down 20 to 30 trees on his land and removed the lower limbs from the ones that remain. “I just hope that everybody does their job -- meaning the Forest Service, the county and the homeowners -- to reduce fire danger around their homes,” said Payne, who didn’t lose his home. Linda Blosser also lived in a neighborhood that was evacuated but unaffected by the fire. While relieved that her home is still standing, she said she’s now worried about the upcoming Memorial Day weekend with continuing dry conditions. “Fingers crossed that we're not going to end up doing this again real soon," Blosser said.